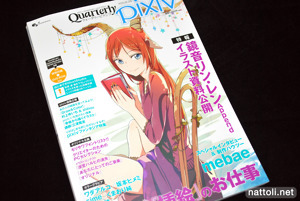 As with previous volumes, Quarterly Pixiv Vol. 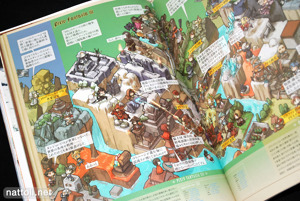 03 begins with a set of illustrations, drawn for the issue itself. 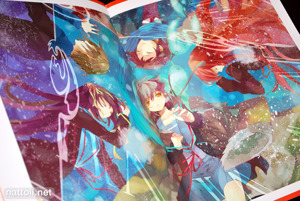 Rco Wada, Sakamoto Himemi, Sime, Kumaori Jun, and Tsukiho Tsukioka are the featured artists this time. And once again, each artist goes over their illustration process, with screen shots and explanations later on in the magazine. But before that are interviews with Niwa, Ota Katsushi, Mebae and Kouji Ogata. 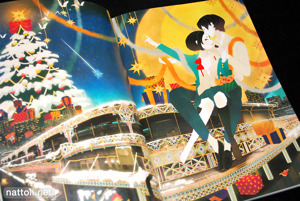 Each of the artists mentioned talks about being a book illustrator and how they became one. Mebae also talks about the movie Tailenders, for which he is an animator and the original designer. 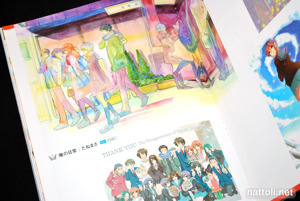 Over the next few pages, Rco Wada, Sakamoto Himemi, Sime, Kumaori Jun, and Tsukiho Tsukioka are all interviewed and given space to show their illustration process for the drawings they did for this issue. 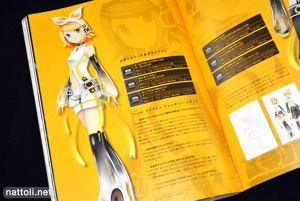 One of the interesting things included in this section is the "Artist's Bookshelf" topic. While most of the artists choose to advertise books or animations they've contributed to, I find it more interesting when they choose books or videos that capture their own interests. 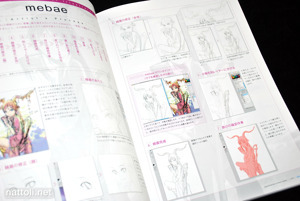 For instance, Sime has a copy of the film Contact while Tsukiho Tsukioka has Yoshiyuki Sadamoto's CARMINE. 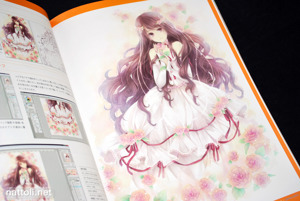 This issue also comes with Comic Studio|EX 4.0, ILLUST STUDIO, and RETAS STUDIO for aspiring artists to try out. 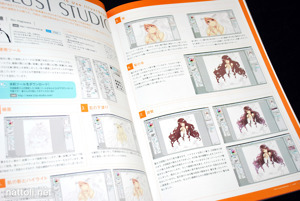 Hagiwara Rin also provides an exclusive how to for ILLUST STUDIO, with detailed screen shots over six pages. 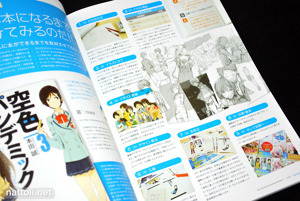 Other points of interest might be the Haruhi Suzumiya Art Competition and its results, though only the winning illustration receives a full page display. 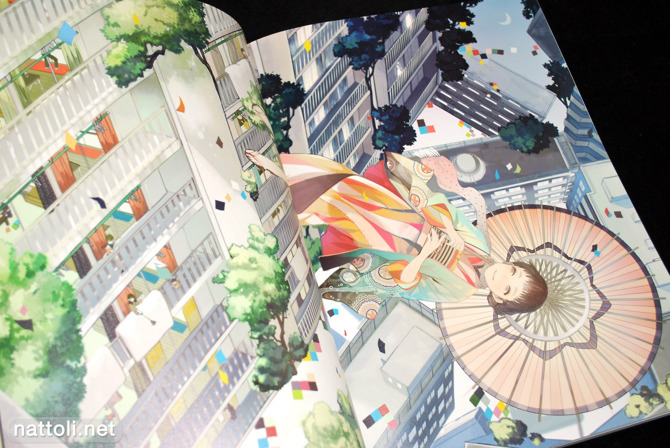 It takes up eight pages, and while most of the illustrations are thumbnail sized you can check them out online because each artists' Pixiv ID is next to their work. There's also a section on Pixiv Fantasia, typography, and the competition results for Your Favorite Things. The rest of the issue includes some of the regular features like drawing with proper anatomy, two 'Draw and Color' illustrations by Shihou and Yuichi Murakami (who had a few illustrations in Moeru Classic Heroine Collection) and P-1 Grandprix results. The judging for the P-1 Grandprix had several big names, including Redjuice, Okama, and Ito Noizi. 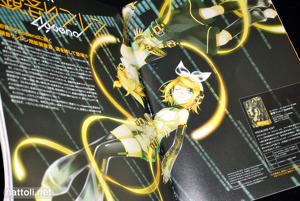 The issue finishes with Vocaloid Append illustrations by Osamu which leads to the contest in Vol. 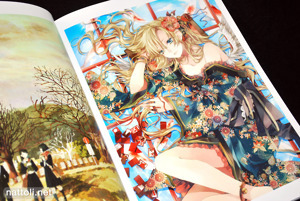 04 ^^ While there aren't a lot of illustrations this time around with Quarterly Pixiv Vol. 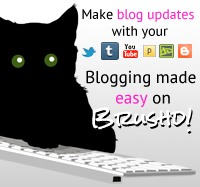 03, it does seem a lot more informative, and would probably be a good purchase for you creative types out there! Iam the creative type out there so Ive got this magazine two months ago! :D ... But sadly i do not speak (tho I can abit Japaneese...), but reading is 0 points for me. The SAI walktroughs looking very informative in there tho!